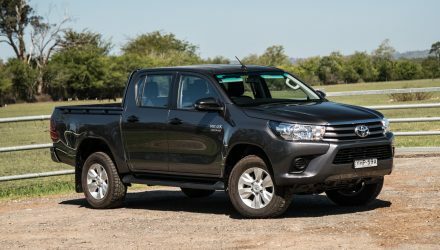 The Toyota HiLux doesn’t exactly need any sweeteners to attract more buyers. It’s already the best-selling passenger vehicle in Australia. 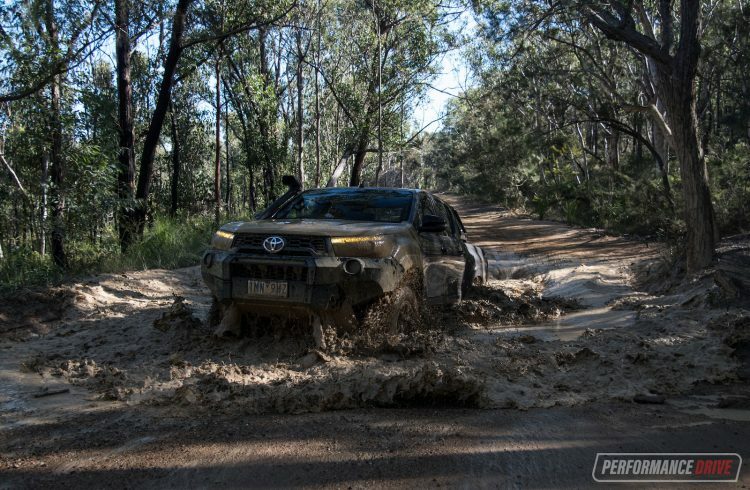 But, it hasn’t stopped Toyota Australia boosting the appeal with the introduction of the HiLux Rugged X. 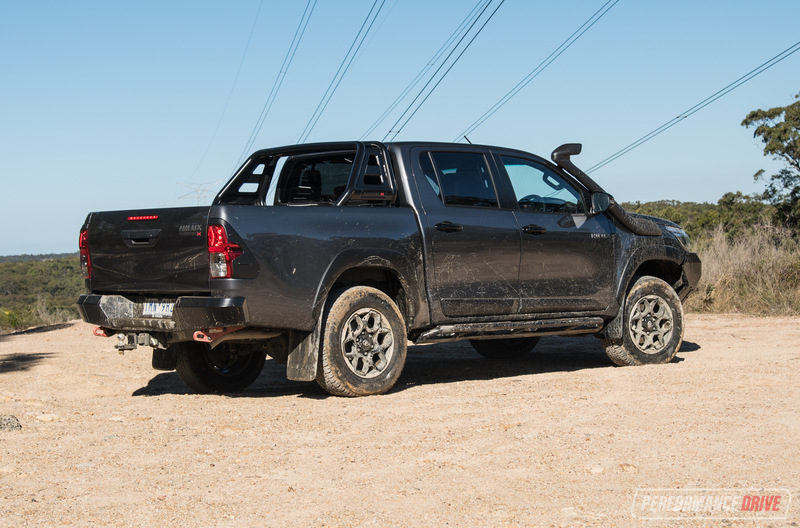 This is one of three bonus-round variants launched by Toyota Australia, over and above the SR5 flagship. There’s the Rogue, which promises a distinct luxury character. 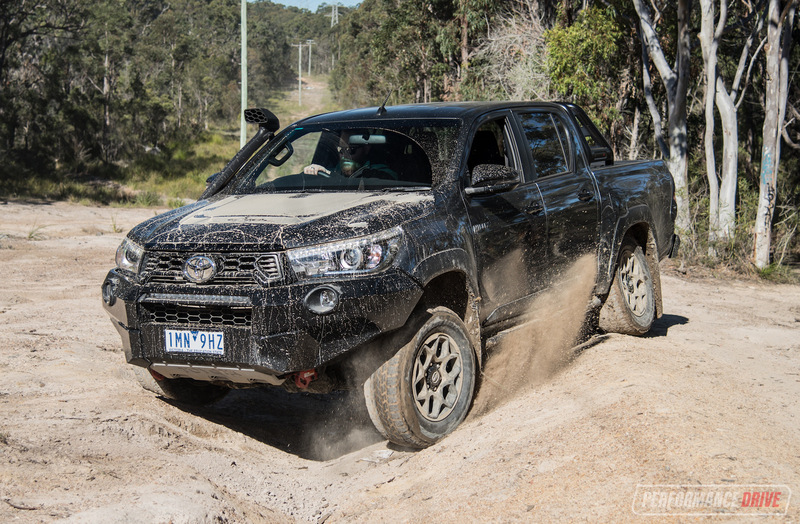 And there’s the Rugged, which is a slightly more… rugged version of the HiLux. And coming in as the new flagship model, the Rugged X. All are based on the otherwise top-spec SR5. 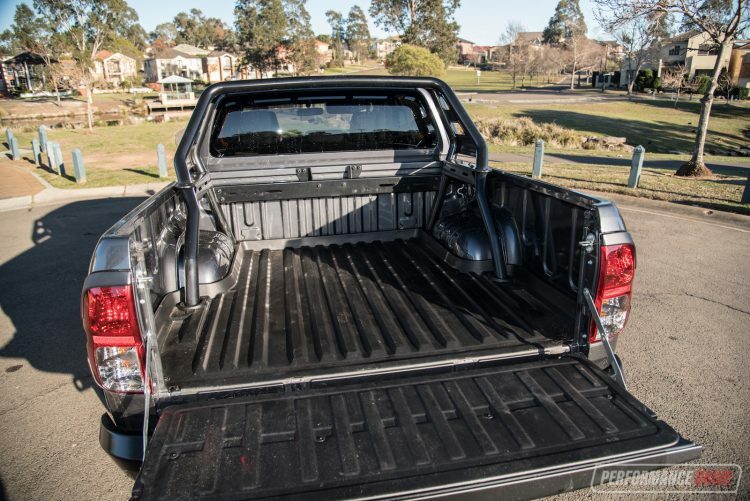 Prices are starting to get out of hand in the dual-cab ute segment as more buyers, with more demands, swarm in to the class. 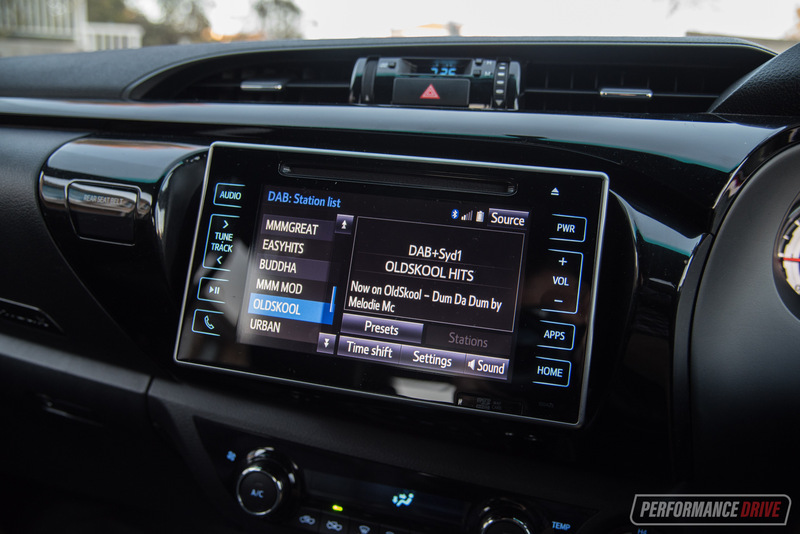 Car manufacturers are also having to tweak and push and pull their current offerings to stand ahead of the crowd. 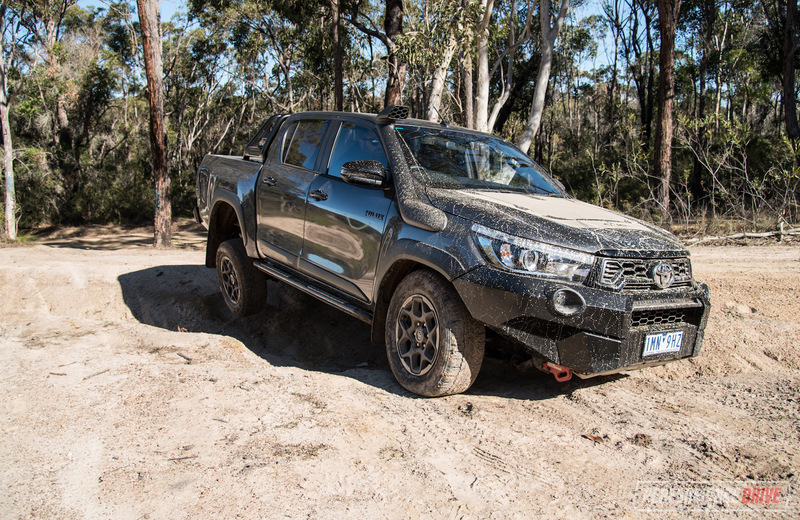 The Rugged X starts from $61,690, plus $2000 for the automatic. That’s $9250 more expensive than the SR5 auto. But, when you think about it, it isn’t such a bad jump considering the special components that are included. And we guess if you compare that price to a similarly-equipped SUV of equal size and capability, you’d be looking at this kind of money anyway. Well it definitely looks tough. 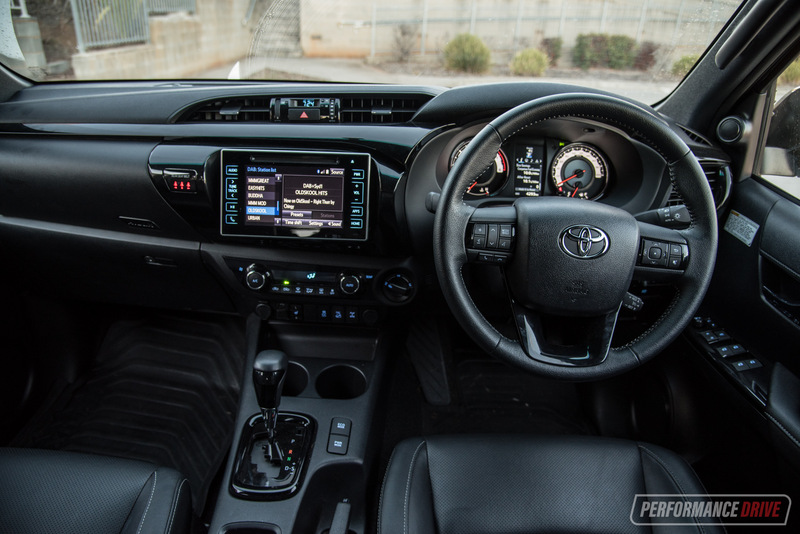 But are these all just superficial garnishes or has Toyota Australia actually enhanced the hardware to improve the overall expertise? Fortunately for off-road and adventure enthusiasts, it’s the latter. 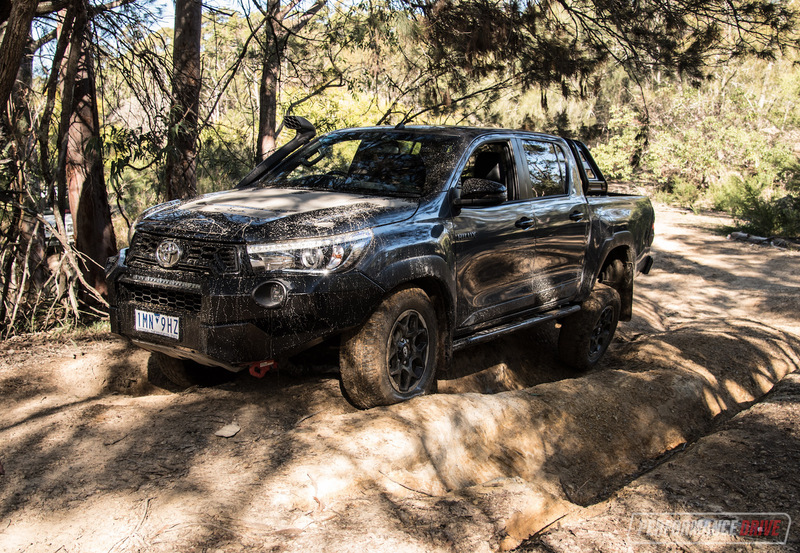 At the front the Rugged X gets a bespoke, integrated steel bumper bar that was designed for the HiLux and developed to retain its safety standards. Under this you’ll see a heavy-duty steel bash plate, etched with ‘Toyota’ so any objects it snags are stamped with the brand letters, with two heavy-duty red-painted recovery points protruding out on either side. There’s also a neat LED light bar tucked away within the bull bar section, which can be switched on during high-beam only. It doesn’t stop there. Along the sides the sills are protected by proper rock sliders with a step shaped into them, with the box-section tilted slightly like a diamond shape underneath to really brace the vehicle against any tall break-over points. Black wheel arches help protect the paintwork at the widest points of the body, while a set of unique 17-inch ‘Tough’ alloy wheels are wrapped in 265/65 tyres (changed from 265/60 on the regular SR5’s large 18in wheels). 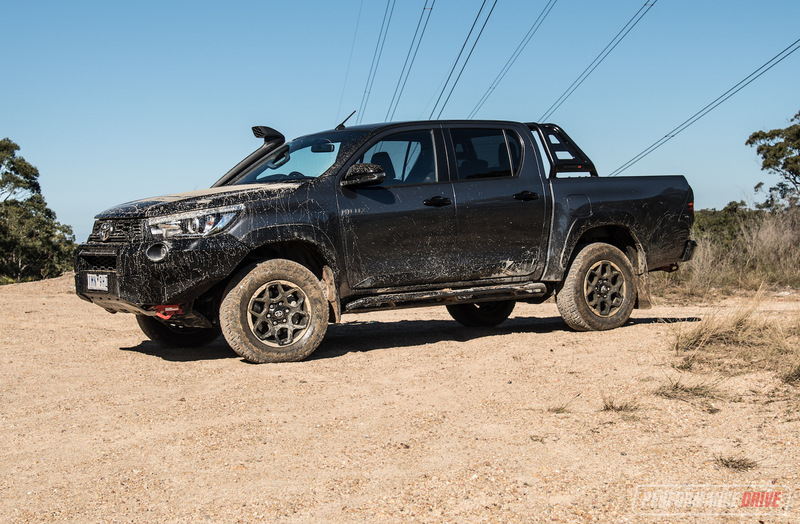 Around at the back is a matching steel bumper bar that protrudes outward to protect the painted panels, with a factory tow bar and towball helping to ruin any ground that tries to stand against the Rugged X’s 21-degree departure angle (down from 26 degrees in regular SR5). Strangely, the front bumper bar doesn’t help to improve the approach angle; it actually drops from 31 degrees in the regular SR5 to 28 degrees here. But, the corner approach is significantly improved thanks to the big cutaways. And, anything that does scrub has to contest against the thick bash plate. 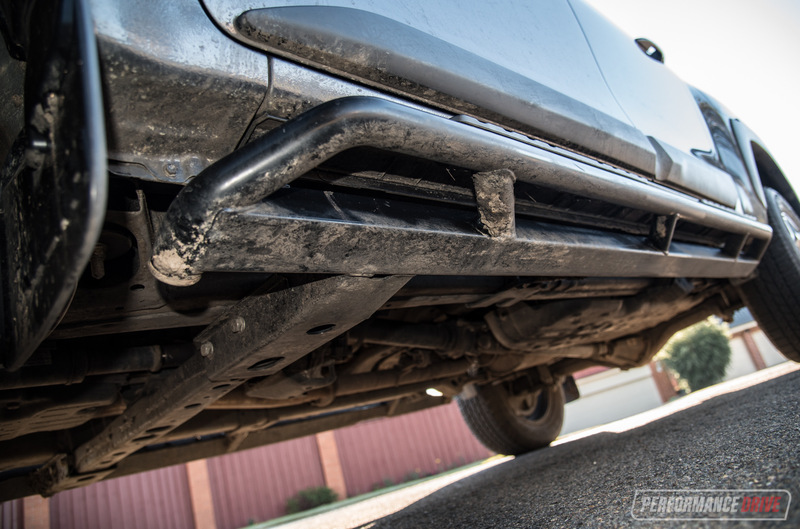 The ground clearance on the Rugged X is listed at 251mm, compared with the 253mm on the Rugged and 216mm on the Rogue, and down from 279mm on the regular SR5. 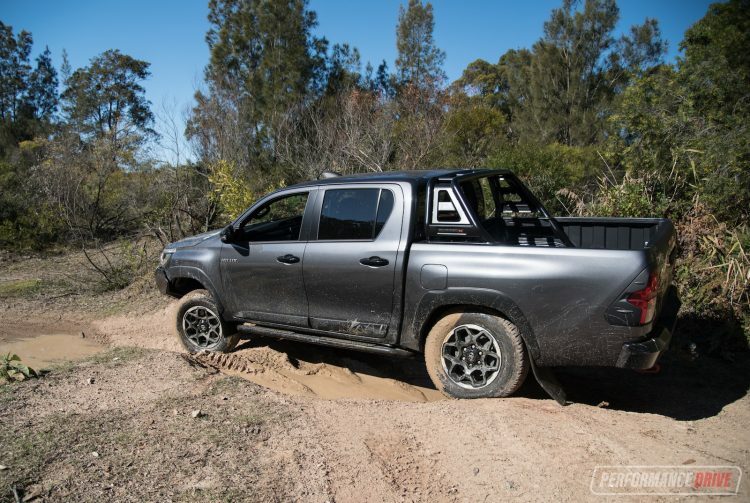 The rear end also features twin recovery points underneath with matt black taillight protectors, a tailgate protector and full tub liner, and a heavy-duty sports bar in the tray that’s bolted to the frame rather than simply fixed to the tray sidewalls. 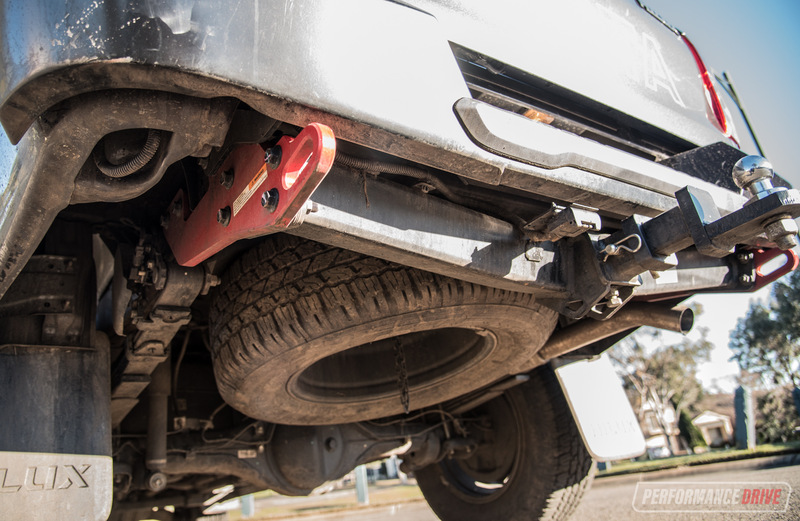 This bar supports up to 75kg of vertical load, while objects secured in the back and tied to the bar can weigh up to 200kg – perfect for a dirt bike, for example. Other cool stuff includes a factory snorkel, gloss black door handles and side mirrors, and a scattering of Rugged X logos. 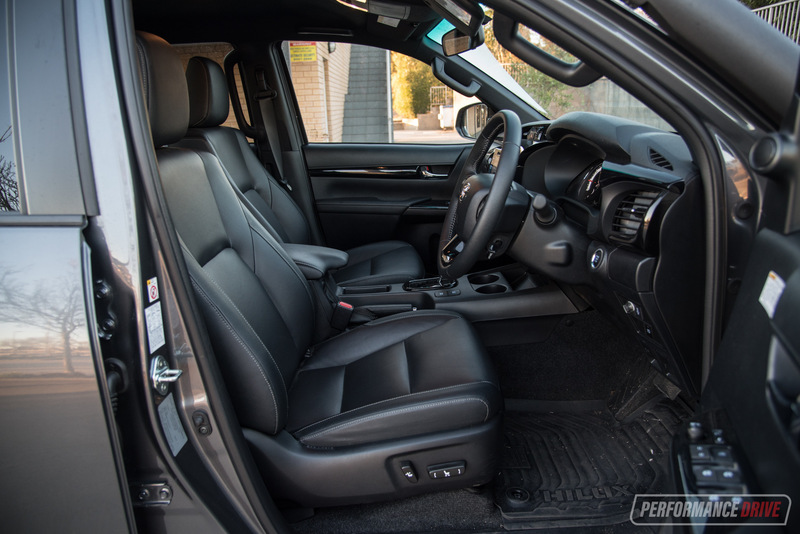 Some enhancements have been made to the interior, but not as many as the exterior. There’s perforated leather-accented seats, metallic trimming around the dash, orange needles for the instrument cluster with unique white backboards, and a set of properly thick anti-slip floor mats which lie exactly over the carpeted floor, including over the drive shaft hump in the back. 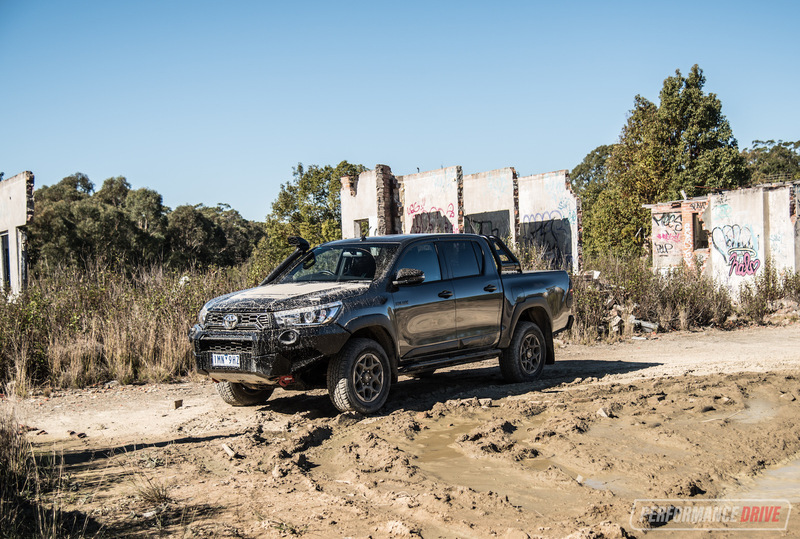 Overall accommodation is the same as the regular HiLux dual-cab range. The driving position isn’t quite perfect in our opinion, like most rivals, but all passengers get a nice perched up view. Most of the controls and in-car functions are very easy to understand, with big clear buttons, and there’s decent storage with two cup holders in the front and bottle holders for all doors. 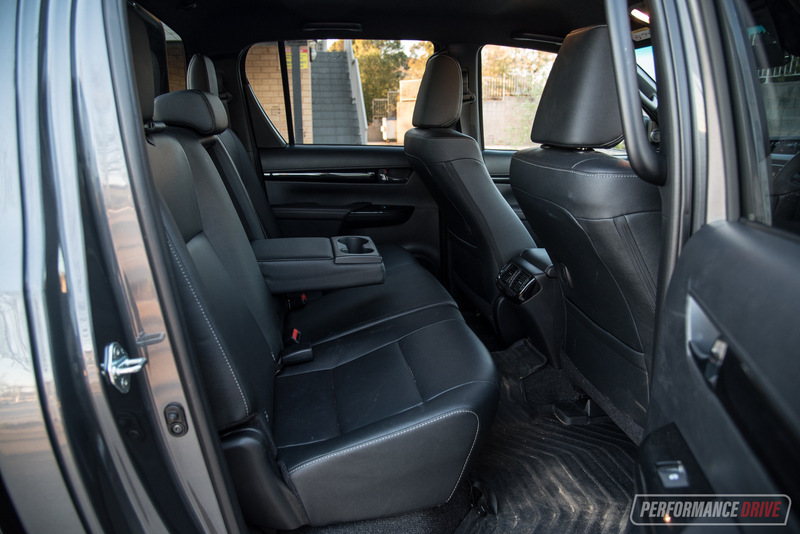 A reverse-facing baby seat in the back does push the front passenger seat forward a little, and we’ve seen slightly more rear seat room in other dual-cab utes, but there are climate vents in the back of the centre console. Vents are usually omitted in this class. Front seat space is more than adequate. 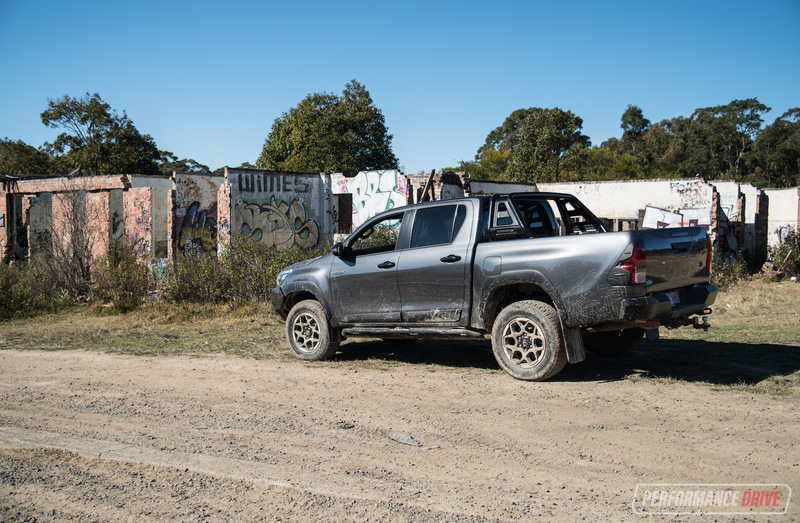 Like the regular HiLux dual-cab, the Rugged X’s on-road driving manners are near the top of the class. 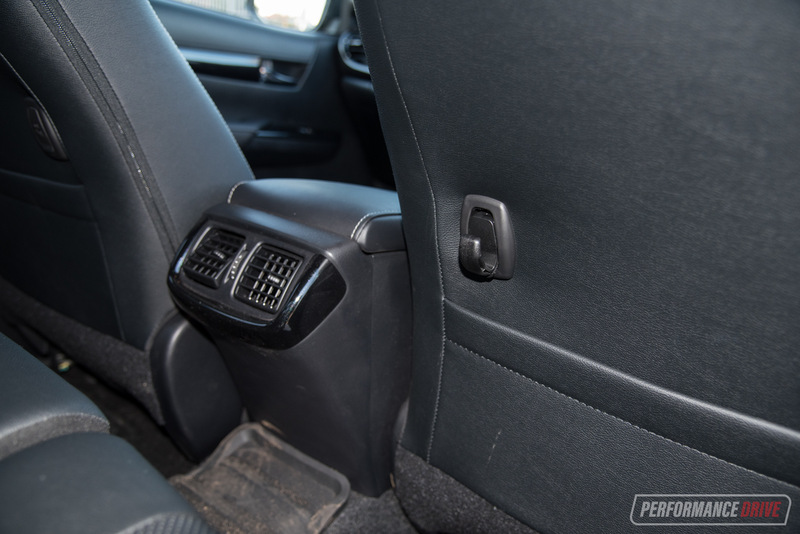 Yes, the rear suspension is juggly compared with some rivals, but stick some equipment in the back such as heavy tools, and the ride becomes much more comfortable. In the front though it’s quite compliant and doesn’t hop over bumps, and the steering feedback sends through a surprisingly planted feel. We like the 2.8-litre turbo-diesel engine. It has a light, free-revving thrum with minor clatter, as opposed to some diesels in this class that deeply clack and vibrate. Once you’re up to speed out on the highway, you’d almost be fooled into thinking it’s a petrol engine. In that sense, it is one of the more refined units in this class in our opinion. Where it starts to let things down is with acceleration and overtaking performance. We clocked 0-100km/h in 12.41 seconds, which is just off average for this class, but the 60-110km/h time of 9.55 seconds it noticeably lethargic. It’s not the engine’s fault, we don’t think, as it seems responsive with good low-end grunt. 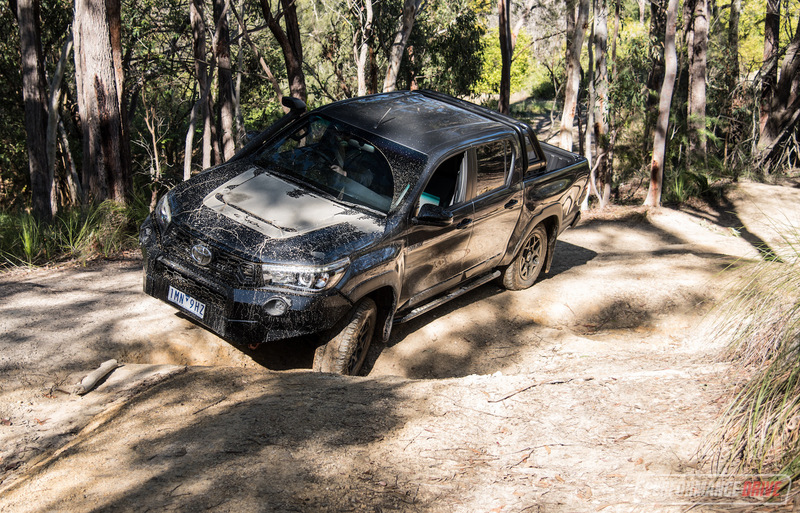 It’s just that it doesn’t match well with the HiLux’s 2252kg kerb weight. 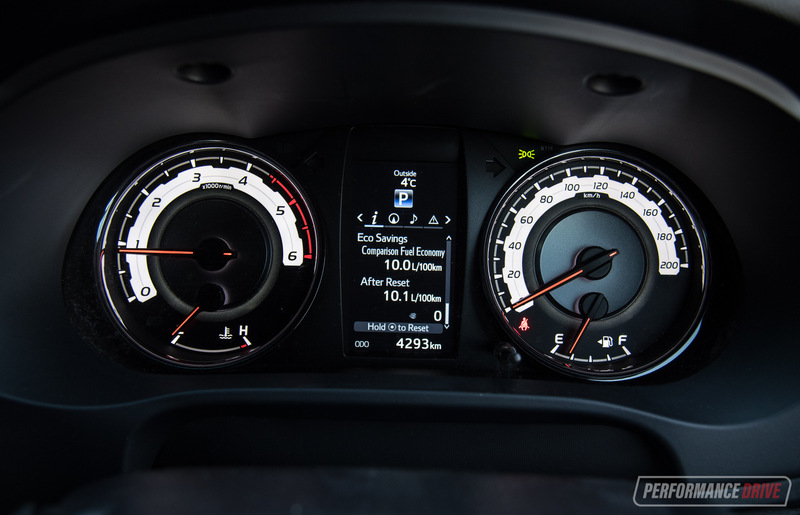 Likewise, the six-speed auto is perfectly smooth and decisive, with a good spread of ratios, but perhaps an eight-speed might make better use of the engine’s power and torque bands, for the weight. Anyway. Acceleration is not really what these vehicles are designed for. Especially the Rugged X. 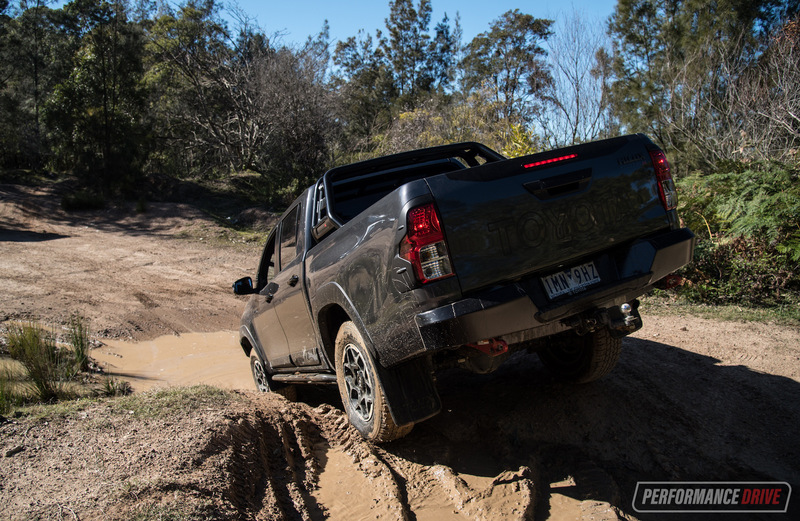 In normal, everyday conditions the HiLux’s ability to get up to and maintain speed is not an issue. It’s a wonderful cruiser, actually. It really purrs along, albeit with the back jiggling if you’re on an ordinary road. Anybody can drive this vehicle with confidence, too. It’s easy to place on the road, with light controls really contrasting against the heavy-duty exterior presence. 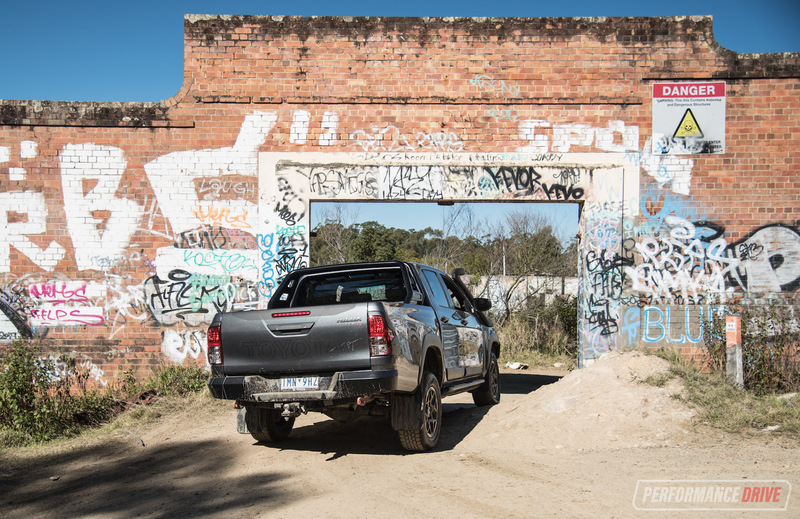 In fact, we think it is one of the least intimidating utes to drive. Okay, so where the Rugged X is born to live is off the road. This is like a pig in the mud, the moment you hit the dirt. Even the ride somehow seems to improve on the really rough stuff. 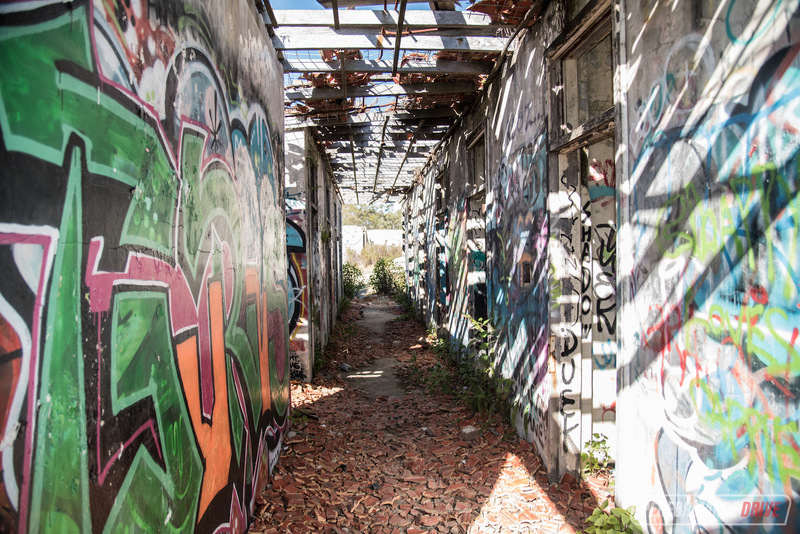 We headed for the spooky, abandoned Morisset Mental Hospital to test out the Rugged X’s ruggedness, near Newcastle in NSW. 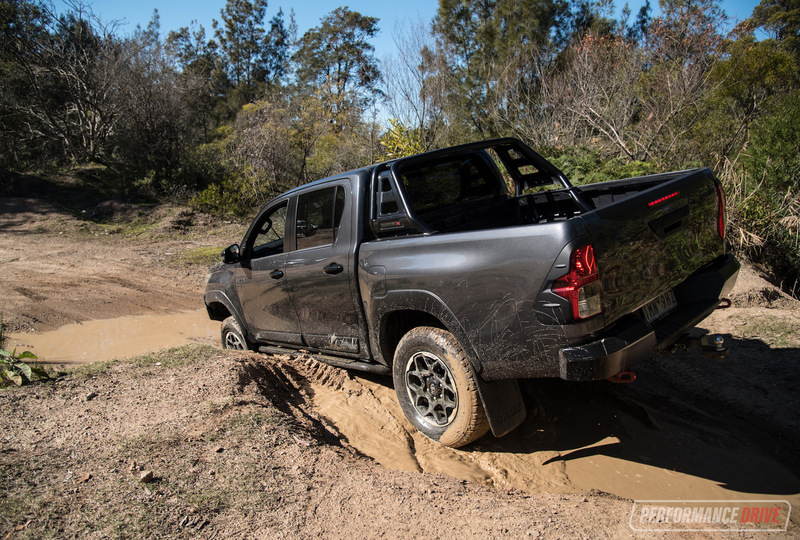 On pretty rough ground with many ruts and mud puddles, the HiLux has no trouble making progress in the regular four-wheel drive mode. 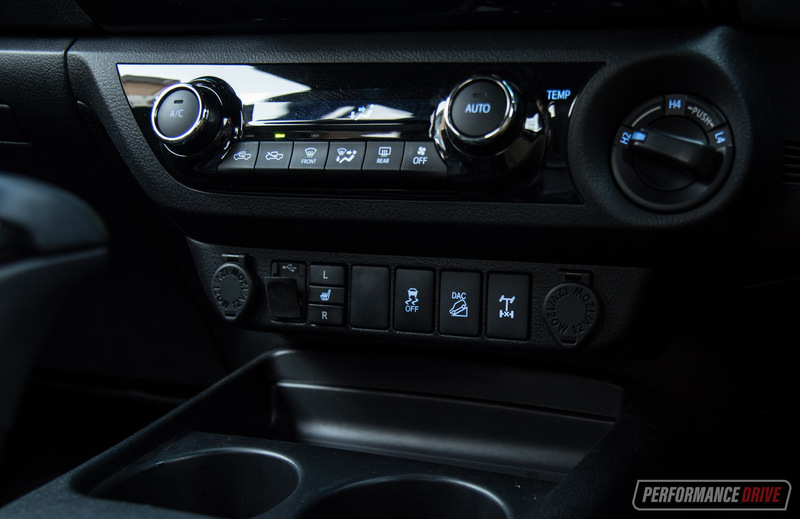 This is selectable via simple twist of a switch on the dash, converting it from its default rear-drive setting. 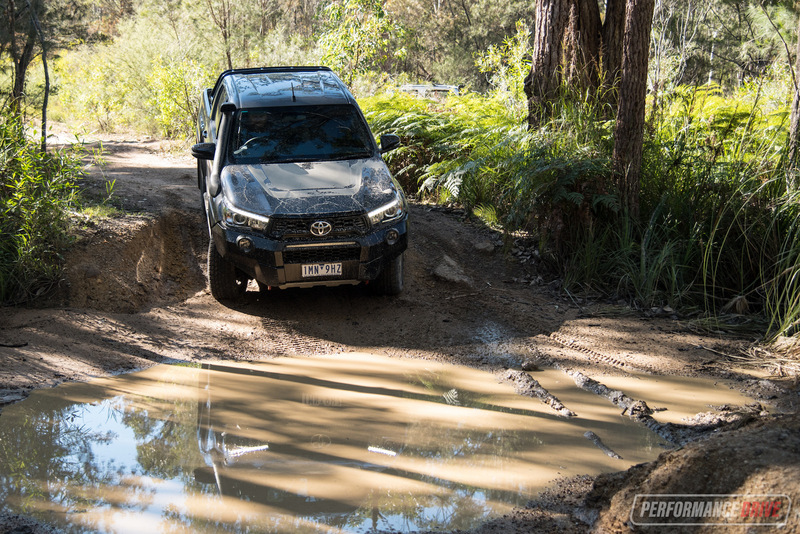 In tougher conditions you can lock the rear differential and use low range, both accessible with simple in-cabin activation, although you do need to be stationary for low-range, understandably. 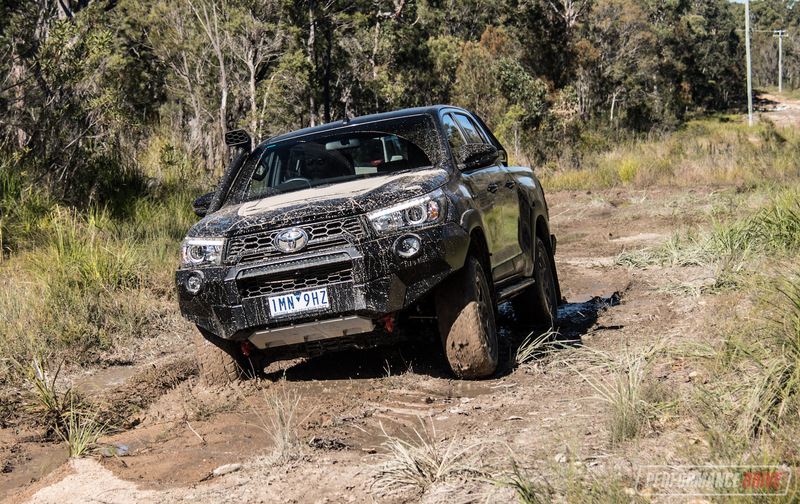 For us, the HiLux SR5 is already one of the best off-road performers in the class. 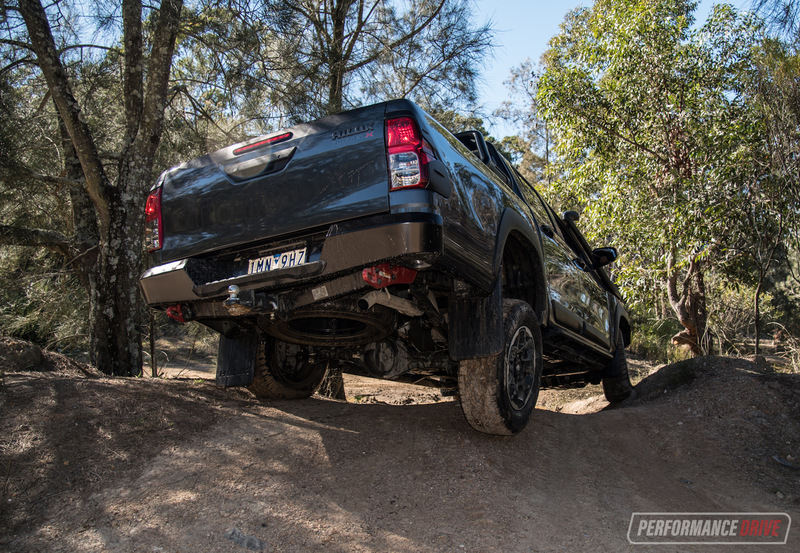 The Rugged X’s side ‘rock sliders’ make the biggest improvement, as they allow you to clamber over steep mounds and embankments without stress. 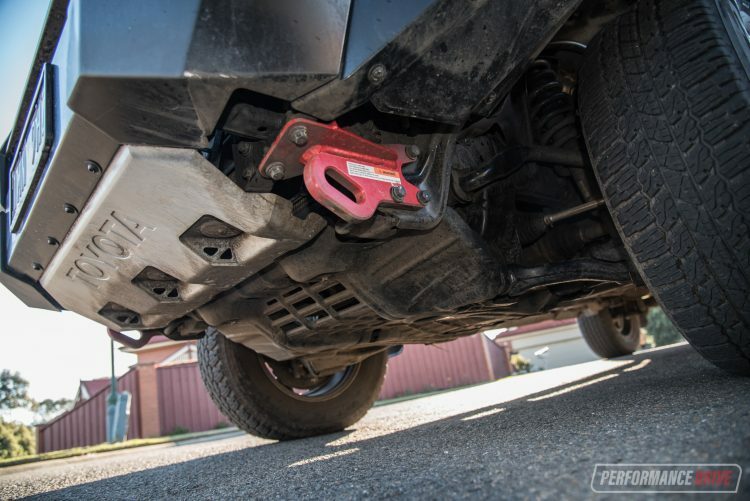 The front bash plate is also a huge help when forging through deep puddles that have deeply entrenched wheel tracks, as the middle section of the undercarriage is protected. It’s relentless. 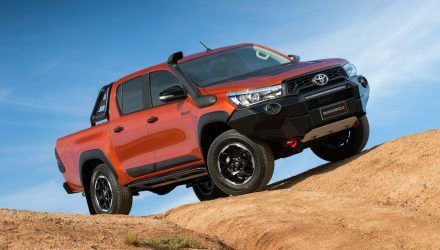 About the only thing Toyota could do to improve the off-road ability would be to add a front limited-slip differential, or a locking diff like in the 70 Series LandCruiser. But that would be getting very serious. In other words, if you need such a feature you’re probably trekking in conditions that are perhaps not designed for a production vehicle. Welcome to the new class benchmark. 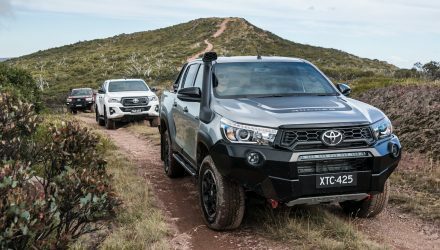 The Rugged X is likely to ensure Toyota remains at the forefront of 4×4 ute dependability, off-road capability, and in-car practicality. Yes, the Rugged X is essentially an accessories pack, but what’s wrong with that? 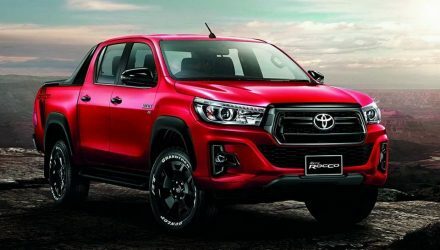 All of the accessories in this case are going to be desirable for those in this market, and they all enhance the already high real-world useabiltiy and adventurous attitude of the HiLux SR5. As for the price? We’re struggling to find an SUV on the current market that offers this much for a lower price. 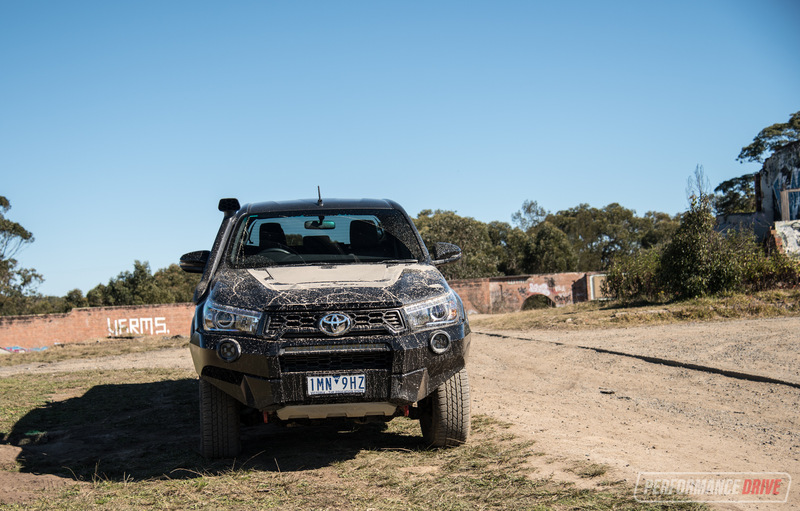 In that respect, the HiLux Rugged X is a suitable family SUV replacement. And with this level of luxury-inspired features and off-road equipment (or accessories, whatever you want to call them), the price doesn’t weigh up too bad. 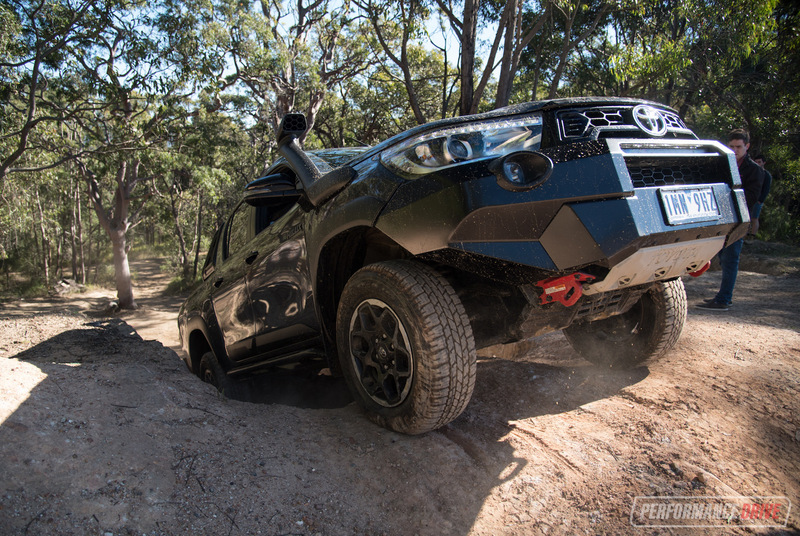 If you’re not planning to do any serious off roading though, you’ll be more than satisfied with the regular SR5.